The idea of the “One Project A Month Challenge" is pretty simple ... To try to finish at least ONE craft project by the end of each month. This can be something you’ve had partly done for a while (a Work In Slow Progress WISP), a pattern you bought ages ago that you finally get around to making up, or a completely new project - it’s entirely up to you. This is meant to be a low-stress challenge - if you don’t finish a project every month - that’s fine! We understand that sometimes life interferes with our best laid plans. We also realise that some projects are meant to be long-term and have a LOT of work involved, like a quilt or a cross-stitch. The main aim of the OPAM Challenge is to give us all a little bit of a motivational boost and to give us all a big cheer squad to encourage and inspire us. However, as May Britt and Kris had discovered last year, there is quite a bit of time and work involved in running the OPAM Challenge, so we have made a few more guidelines this time that we would ask people to please take note of AND please only sign up to join us if you intend to follow through. If for some reason during the year you decide you don’t wish to remain part of the OPAM Challenge, just drop Kris or me (Peg) an email to let us know. Your name will stay on the list so that any finishes you DO register will go into the end of year draw, but we will make a note not to check your blog each month. Please read through all of the guidelines before you sign up. 3...Participants can sign up via email to Kris or Peg or via a comment on EITHER blog AS LONG AS it includes all asked for information. 5...Participants MUST have the OPAM Challenge badge on their blog sidebar and link it to either Kris or Peg’s blog. 7...Only ‘soft’ crafts are included in the OPAM Challenge, ie. Projects made from fabric or wool. Some examples are: embroidery, patchwork, quilting, cross-stitch, knitting, crochet, practical sewing (curtains, clothes etc), long stitch, appliqué. 8...QUILTS: A quilt will only be counted as a finish if it is COMPLETELY finished ... Quilted and bound. Flimsies/tops won’t count as finishes. 9...BOM’s: Blocks that are part of a BOM (Block Of the Month) program will only be counted as a finish when they are joined, quilted and bound. Individual BOM blocks DO NOT count as a finish. It will be fun just being a member this year. Yes, please I like to join the challenge, sounds like fun! I've send you a mail. I would like to join please. It sounds like fun. I'm Canadian, but currently located in Korea. I would like to join in too and have sent an email to you with my details. Hi Peg. I've sent you an email with my details to join in OPAM 2010. I can't wait to enjoy the OPAM with you and Kris again this year :o). I've emailed you with my details!! Hope your dear Mum continues to improve!! Finish my Ufo is a dream. I'll sand you a mail. Morning Peg, I have sent you my detais by e-mail. Looking forward to joining in. Hope Mum is doing well. I would love to participate! Surely I can do one a month!!! I am sending an email. I would love to join this. Maybe I will get something done! Ha! I am looking forward to 2010! I will email you the info. Thanks for all this hard work. I did just sent you an e-mail and I hope I can participate! Waiting for an answer, hugs, Renata. I would love to join...will send you an email as well. Just the prodding I need to finish up a lot of things I have sitting in my sewing room! 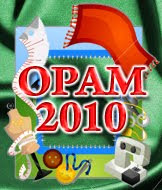 Hi, Peg - I've e-mailed you my details to join in on OPAM 2010. I just sent you an email Peg so Hope I'm not too late with my signing up. Do we put the logo on our blog now or wait for till we get the nod. I would like to join in I think this will help me stay motivated, I can't get the badge to my site. can you add me and or e-mail me? Count me in if there's room! I'll email my information to you. This will be great fun! Enjoy Peg, I wish you great fun with this! I won't be joining in as I'm not sure how much sewing I'll get done this year. But I'm looking forward to all the great projects everyone blogs about! Please count me in Peg.... this sounds like just the encouragement i need! Email on it's way! I would love to join up. Been watching to see if you would have another, as I just came across the 2009 Challenge last month. Emailing you my information. Hi Peg...this is a challenge for me...I think I would like to give it a go!!! Email coming. Hi Peg: I would like to sign up: I am a great starter of projects and would like to be a better finisher! I have emailed you with my details. Do hope your Mum is doing well. Thanks for doing this great job for the quilting girls around the world. I would love to participate. Email is on it's way to you. I have just emailed you to join! I was hoping this would run again this year, it helped to keep me focused on finishing instead of continually starting.....*grin* Hope you enjoy co-hosting Peg! I have just send an email to Kris to join the challenge! Thanks so much for hosting! I am hoping this will keep me on my toes! Count me in, Peg. I'll send you a separate email with the info that you need. I'D like to be in. Am I in 150? I'd like to join!! I'll send you an email with my info. Hi Peg! Sent you an email with my info..sure hope I make the list again this year! I woke up this morning and thought of this sign up first thing. I've sent you an email. Looking forward to visiting lots of productive bloggers this year! I've just sent you an email with all the info, I'd love to join !!! Hope your mum is doing well! Yes, please can I join! I'm going to send you a mail after leaving this comment! It sounds like fun an a challange! i've sent in an email too! Can't wait to see what everyone does this year! I would like to sign up for this challenge, it sounds like fun. Did I make it in? I'll send a separate email to you. OK--my "to-finish" lists says that I must join you all in this project!!! I am emailing you now!!! Hugs, Di&co---Thanks for doing this! PS also you might like to see my Christmas mice finish over on my site--just finished it--ah--like yesterday even!!!! I would love to join the opan this year as well. Just emailed kris. Am I too late Peg? ...hope not! Please join me up, if not too late.. I hope that I'm not too late to join up! Let me know before I post your button on my blog :o) Thanks so much for doing this! I live in upstate New York, USA. Is it to late to join in the fun? I have lots of UFO's that need to be finished! I just noticed the badge on Val's blog about OPAM and would love to join if it's not to late. I not only want but need to join! I live in the USA and I will add this to my blog. OK so I thought it couldn't hurt to ask - but have you got your 150 yet? I know it's late, but I'd love to join in. I am sorry I missed this challenge! I just came across the OPAM icon today - I love fabric crafts & can't wait to see what everone has created! Thanks for the "eye" candy! I will keep my eye out for 2011. We [url=http://www.casinogames.gd]slots[/url] be suffering with a corpulent library of totally free casino games championing you to play right here in your browser. Whether you call for to unaccustomed a provender recreation plan or just sample manifest a insufficient late slots in the presence of playing for unfeigned money, we procure you covered. These are the rigid still and all games that you can play at earnest online casinos and you can play them all quest of free. Berry Slice – OPAM 2010 finish nearly..
What have I got myself into…..